I recently told you that Gordon and I always like to have a table for two on a cruise ship and gave you a good example of why we find that to be a good idea. Now I would like to tell you why we like to explore the ports that we stop at on our own instead of going on the tours organised by the cruise ship. It is our second day in Dubai and we still haven’t been deported. But the choice of things to do is somewhat limited. You can either go shopping, or go on a desert safari, or go shopping. A desert safari involves traveling out to the desert in a 4×4 Toyota land cruiser, and driving through a large conservation area in the hope of seeing one of the few animals that have adapted to living in the desert. But a big part of the attraction is to go “dune bashing” – driving over the enormous sand dunes (beautifully coloured deep red and yellow sand) as fast as the driver can go, slipping, sliding and flying off the top of the dunes. Think roller coaster but with bumps thrown in. I couldn’t wait to do it. Gordon could – and did. He flatly refused to come with me. The price to do it on my own was prohibitive, so against my better judgment, I decided to go with the organised tour from the ship. All the advertising describes the dune bashing in some detail and says that no one with a nervous disposition or with a bad back or neck should go. There were forty of us and we were met by 10 land cruisers. 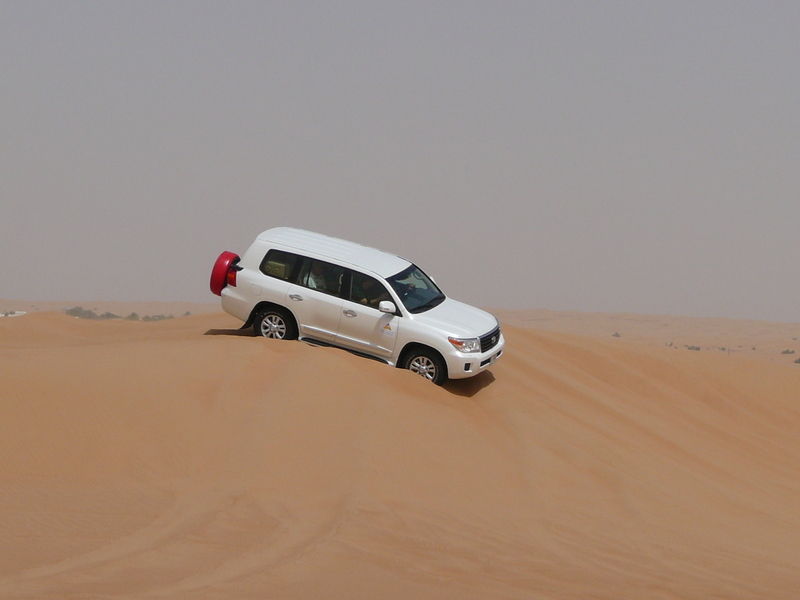 The tour organiser would have been at a total loss without his calculator, but with it he worked out that four people would be assigned to each land cruiser. I was put with Jack and Jill (really! I am not making that up) a couple from the Carolinas, and Frederick. Frederick did tell me where he came from but I have forgotten everything about him except how annoying he was. He was in his seventies, tall and slim with a tidy white beard, a large safari hat with the brim pinned up on one side to the crown, a beautifully pressed safari shirt and matching trousers. While the rest of us had dressed for a four hour car ride, Frederick was dressed as if he was about to mount an elephant and travel through the Indian jungle about 100 years ago. He carried with him an enormous camera which he pointed at everything we passed regardless of whether it was interesting or not, demanding that the car be stopped so that he could properly focus on the weed in the sand, or the road sign that said “Dubai”. We hoped we were never invited to see his holiday snaps. Far more disturbing was the fact that Frederick also carried a walking cane on which he relied greatly. We had a short walk to the vehicle which took him about ten minutes. The driver suggested that we all took turns sitting in the front passenger seat which of course had the better view. Frederick suggested rather strongly that he be allowed to sit in it the entire time as his legs were not too good and he needed to be able to stretch them out in front of him. Jack, Jill and I passed a look between us that should not be put into words for fear of upsetting those of you who don’t like vulgar language. We got into the car and the driver asked if anyone had a back problem. Frederick immediately said that, yes, he had spondilitis. The driver said that it was not a good idea for him to make this trip. Frederick had so much room in the front seat that he was able to stamp his little feet and insist that he go. The driver said that he would have to sign a waiver in case anything happened. Frederick reluctantly did so. Meanwhile I was in the back with Jack and Jill and beginning to realise that while Jack was rather a nice older gentleman, Jill was not. She was definitely older but she wasn’t nice, nor was she a gentleman. She asked in a loud voice why Frederick was signing something. Jack explained it to her. “Why does it matter if he has a bad back” asked Jill. “You’re right. I wouldn’t have come. I am not happy about this” replied Jill and continued to demonstrate that fact for the rest of the trip. She whined for four hours. She whined about the car being too cold, she whined about the desert being too hot. She even complained that there was too much sand everywhere. 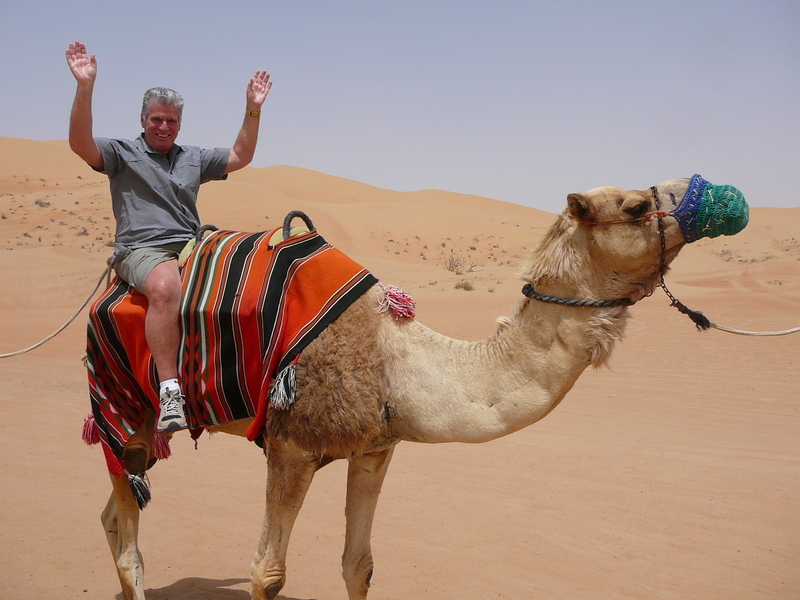 When we got to the desert, the driver immediately started accelerating up and over the sand dunes. “You’re making me car sick” cried out Jill. I knew exactly what I wanted to yell out, but I didn’t. Periodically the cars would stop for a photo opportunity. By the time we caught up with the other 9 cars everyone had taken their photos and were getting back in the car. Our driver asked us to hurry. Jack and I would leap out of the car and take our photos and get back in the car. Jill also got out, but hobbled back to the car complaining that she had got a stone in her shoe. We were in the middle of a huge desert. There wasn’t a stone to be seen anywhere, but somehow Jill had not only found one, but contrived to get it in her shoe which was already amply filled by her oversized foot. This was the one and only time Jill attempted to get out of the car. After that she refused, saying that it was too hot and too sandy outside, and besides she didn’t want to get another stone in her shoe. I wanted to suggest that she fetch a pail of water. While all this was going on Frederick was still struggling to get out of the car. So dear readers, that is why we never go on an organized trip. Despite this, there were some highlights of the day. 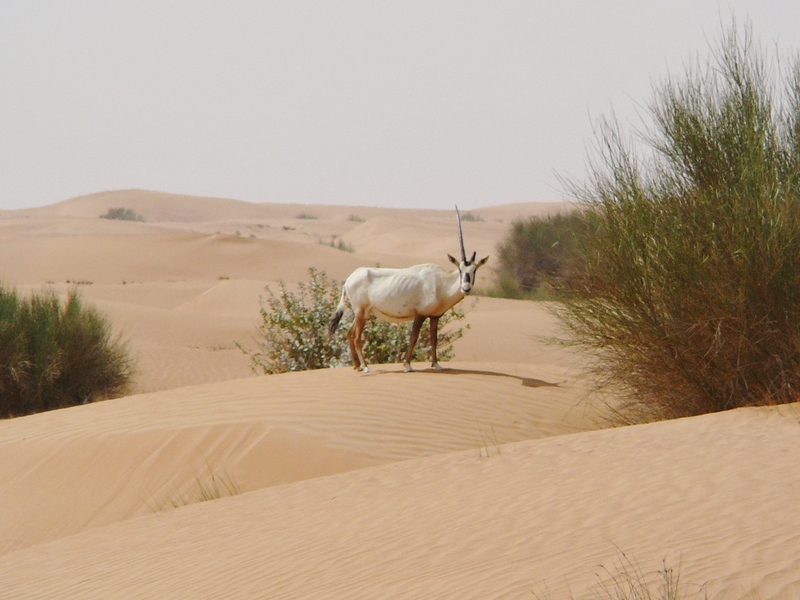 We did see one Oryx, an extremely rare desert animal. They usually have two very long horns, but this one only had one. Any unicorn seeing it would immediately suffer from horn envy. Just look at that silly old man waving both arms in the air. What must the camel be thinking. This entry was posted in Dubai. Bookmark the permalink. Just curioous, do you love Dusneyland too?? Weird rides, etc. These folks easily beat out Mr. Nasty and Carol with an E and least likeable trip companions!